Mudville Musings: I need a name! Please Help! I need a name! Please Help! So, after mourning for nearly 8 months and keeping a vigilant eye peeled for a suitable replacement, a friend and teammate may have delivered my new "man of the house" right to my doorstep. 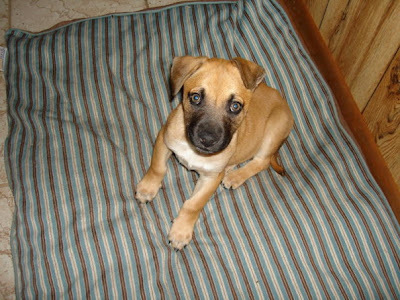 This handsome young dog is part boxer, black mouth cur and mastiff. He has found a good home if I get offered him and he's gonna need a name to go with all the TLC he's gonna get. So far, the submissions have included Apollo, Rucker, Clint, and Brewski. I am putting off naming him until I have him in hand and plenty of time has expired to give submissions a chance to get posted here or on facebook. Looks like the fence getting built has been shoved to the front of the to-do list at the house. Good thing my son is here to help me out this week. So let the name dropping begin! OMG, a puppy!!! He's so cute. I agree. It's hard to come up with a name without "knowing" him. His eyes are gorgeous. I think Brewski would be a cute name. But you know, I've always favored Marvin, too.